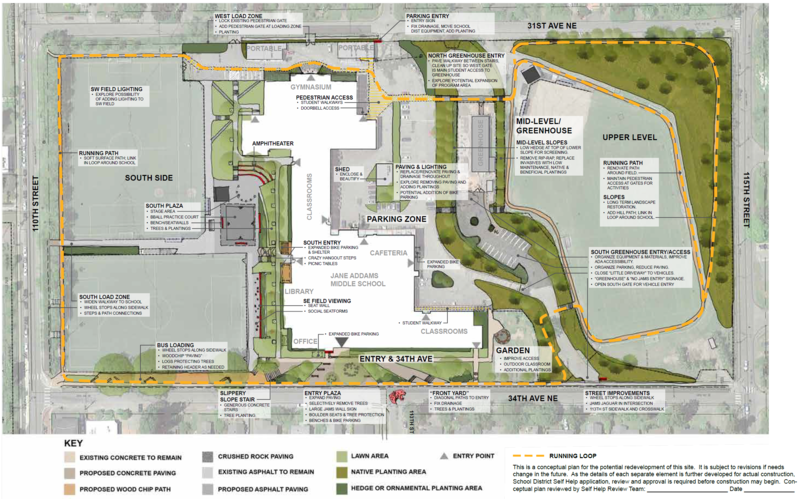 The main impetus of the Jane Addams Middle School (JAMS) Landscape Master Plan (LMP) is to make the outside campus a better match for what goes on inside this vibrant school. Friends of Jane Addams Middle School organized and got a planning grant to hire Johnson+Southerland, landscape architects and planners, to help put together this plan. The spirit of the LMP is expressed in the FJAM’s slogan and in their reasons WHY to do a master plan: JAMS Dream Big! We have fun here and the outside doesn’t reflect that! Let’s plan a fun, inspiring, functional and safe school campus and athletic complex for students, neighbors and the community at large. The JAMS building originally opened in 1949 as a junior high school in the Shoreline School District and was annexed into Seattle Public Schools in 1954. The building closed as a middle school in 1983 and was leased to various tenants. In 1985, the Summit K–12 alternative school moved to the building. From 2009-2014 the building was occupied by the Jane Addams K-8 program (now named Hazel Wolf K–8). Jane Addams reopened as a comprehensive neighborhood middle school in fall of 2014, so it is still a very new school getting accustomed to its building and site. While the interior of the school underwent a small modernization from 2014-2017 the exterior landscape has remained untouched over the past 70 years with the exception of artificial turf fields installed in 2000. JAMS serves about 900 students and shares its 20 acre campus with many other users - the Nathan Hale greenhouse program and outside sports leagues are the main users of the northern third of the site. Generally, the school site is a series of terraces separated by steep slopes. To understand site issues and community aspirations, the design team worked closely with the FJAMS committee and Seattle School District personnel, conducted a series of public meetings, interviews, observations and questionnaires and conducted a site analysis. It is hard for visitors to find the front door of the school (the entry is obscured by trees and the big identifying sign is on a different side of the school). The campus, which still has a playground that is age-inappropriate and off-limits to students left over from earlier site uses, offers little to engage or accommodate middle-schoolers. There are safety issues in drop-off/pick-up areas. There is not enough pedestrian paving on site and it is not well-located to accommodate the numbers of student pedestrians and their circulation patterns. Paving throughout the campus is in poor condition. into the school on a wet day without wading through a puddle. There are access issues for students getting to the portables. There is a need to accommodate vehicle and pedestrian access to the greenhouse and upper sports fields by outside groups but to keep it from becoming a backdoor entry to JAMS. The slopes separating the main terraces of the upper site are steep, difficult to maintain and have been colonized by invasive species. Help us raise $100,000 to fund the first phase of our project. Donate $250 or more and get your name engraved on one of the tiles on the new staircase! Check out our Donate Page for more info! The opportunities offered by the site is an abundance of space. There is room on the south side of the school for student-oriented improvements. The slope south of the building offers a natural amphitheater overlooking the central space and sports fields. People point out the greenhouse and garden as resources that could be enriched and better used. Safe, functional walking routes for students, staff and visitors. Safe, durable surfaces located where actually needed for walking and biking routes. Adequate separation between vehicles and pedestrians. Walking surfaces that are properly drained. Green stormwater infrastructure as required to compensate for new and replaced paving. Explore removal of excess paving for trees, rain gardens, etc. Improved wayfinding, aesthetics and environment. A welcoming front entry that is well identified, easy to find and expresses character of JAMS. A back entry that is clearly secondary but uncluttered and well-maintained. Additional trees and plants where appropriate. Development of the current playground area near the lower fields for hanging out and playing. A functional outdoor basketball practice court. Separate vehicle access to greenhouse from access to JAMS. Improved student access to the greenhouse with the north gate the main student pedestrian entry. Clean up, reorganization and screening of clutter. On slopes, replacement of invasive plants and rip rap with appropriate, sustainable planting and landscape development. Fence, gate and paving adjustments for improved circulation. The intent of the LMP is to address all of these goals and to represent the community’s vision of how it would like to see the campus develop. 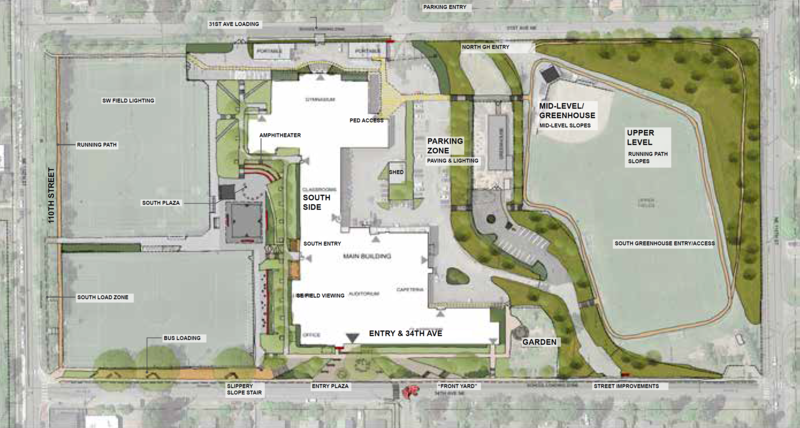 Highlights of the LMP include a new entry plaza and “front yard” to the building and redevelopment of the existing playground into a basketball practice court, adjacent “hang-out” areas and an amphitheater. Many smaller improvements are included, such as an outdoor classroom in the garden area and expanded bike parking. Mundane issues that aren’t as glamorous but are important for safety and functionality, such as lighting and paving and drainage improvements, are also addressed. The LMP makes some suggestions for phasing based on community input and technical feasibility and it provides preliminary budgeting estimates. However, it is not an implementation plan. It is a guide for various interested groups for instance the school district, the JAMS PTSA, the NHHS greenhouse program, outside sports groups who are motivated to come up with funding to complete design, permitting and implementation for specific projects within the plan. The development of the JAMS Landscape Master Plan was a process of combining the design team’s growing understanding of the JAMS physical site, its issues and opportunities, with the concerns and aspirations of site users and interested parties to develop, first, a series of alternative designs and then, based on community input, a final plan. 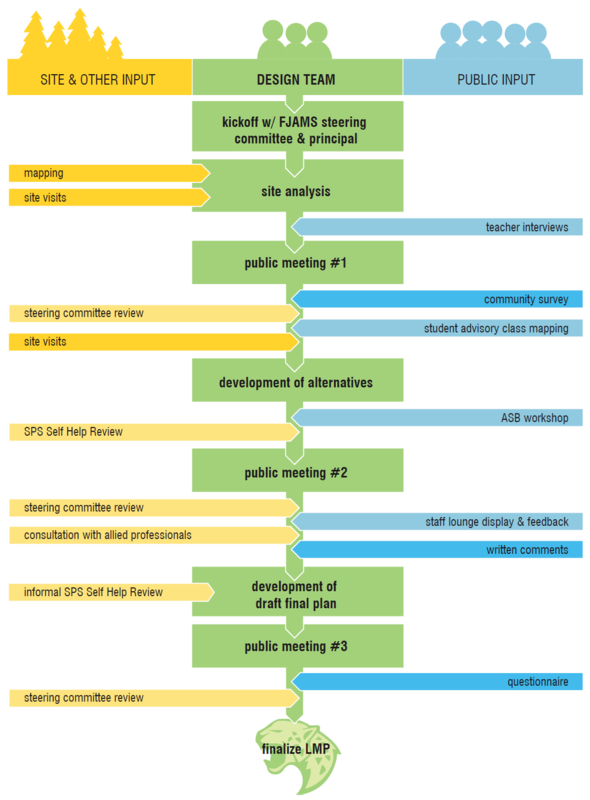 The process diagram shows how we worked closely with the FJAMS LMP steering committee and got input throughout the process from a variety of sources: teachers, students, school district staff, JAMS families and interested community members. Community input is summarized in the appendix. Throughout the project we checked in on parameters that might affect development of the plan, consulting allied professionals (civil and lighting engineers), land use and building code and Seattle School District’s Self-Help Committee. In general, community preferences have been non-controversial. In a few cases where community direction was unclear, we sought clarification from the steering committee, principal or school district staff. The JAMS Landscape Master Plan is the statement of a community-driven vision for a more functional, engaging and inspiring school campus. It is also a menu of projects that may be phased in to achieve that vision. Some of the projects will be “spotlight” projects that are highly visible and will create new social, play and educational opportunities. Many others such as paving and drainage improvements will be less obvious but will take some of the daily stress out of navigating (and maintaining) the campus, making it a better place to study and work. It is likely that a variety of parties--Seattle Public Schools, the JAMS PTSA or community sports leagues, for instance--will instigate progress on different projects. Projects will proceed depending on each group’s priorities and available resources. All projects done on the JAMS campus must be approved by SPS. Most of the projects outlined here will require additional design work and many also require permitting by the City of Seattle. Included in the Master Plan are enlarged plans, descriptions and rough budget estimates for projects or groups of projects. They may be broken apart differently than we have shown here. While the LMP provides the basic concept for each project, any specific project will be developed with more detail and may end up looking significantly different than shown here. A note on paving and drainage. One of the campus-wide problems is that there is not enough paving to handle pedestrian traffic and that the existing paving is in poor condition needing replacement. Seattle (and the entire State) has strict policies about managing rainwater running off of impervious surfaces such as paving. JAMS is in a “constricted capacity basin”, meaning that runoff from JAMS goes into a City drain system that is already at capacity and furthermore, it flows into Thornton Creek. Therefore, the requirements for mitigating the impacts of any new or replaced paving in this neighborhood are particularly strict. At JAMS, any project that adds or replaces more than 2000 square feet of paving will need engineering and City permitting and will probably require adding storm water detention facilities. Storm water requirements should not be considered an insurmountable impediment to doing projects, but it does add significant cost. added a 30% allowance for soft costs for budgeting purposes. As the projects are designed and developed, their costs may vary significantly from these budget estimates depending on more detailed investigation of site conditions, design choices or the general contracting climate. These budget estimates were developed in 2017-2018 dollars and should be escalated to account for inflation in the future. The complete Master Plan document may be downloaded here.